he Fenice needs all the help it can get to rise from its ashes, and the new CD-ROM, "La Fenice: visite virtuelle d'un Opéra à Venise", is a more than worthwhile contribution, as proceeds from its sale will benefit the reconstruction. 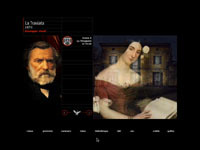 One of the major attractions of the disc is the virtual visit of the Fenice, with a plan to indicate where you are for those who like to have the facility of an architectural drawing, and this on three levels. There are 36 vantage points where you can stop and catch your breath. 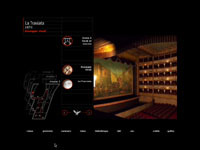 fter this whirlwind tour of the site, one can indulge in one of the ten historical evocations linked to the world premieres of such works as Rossini's Tancredi or Semiramide, Verdi's Ernani, Rigoletto or Traviata, and Stravinsky's Rake's Progress, all accompanied by animated dialogues indicative of the socio-historic context. Within the written texts one can move back and forth to both pictorial and written closeups connected to the work in question. If you prefer a more orderly approach, you can shift to the documentation section which enables you to look either chronologically or alphabetically to find out about composers, works, performers (many with sound bites), and well-known observers (Byron, Stendahl, Auden). 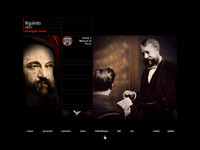 he disc is available in French, while all but one article in the fascinating library part of the disc are in Italian. We can only hope that this will not deter non-francophones from acquiring a superlative CD-ROM. Other statistics: 60 minutes of dialogues and commentaries, 60 minutes of musical extracts. Partners in the production are the Opéra National de Paris, Le Monde de la Musique, Radio Classique and Index+. t the same time, we must ask whether such a disc is only a toy or does it have an intrinsic value. Serious scholars will more likely avail themselves of the complete information available in an encyclopaedia such as the Grove Dictionary of Opera. The only advantage here is that you need not know the alphabet nor need you turn pages. Fortunately, you still have to know how to read.